New York City is known for being expensive, so it’s always a pleasant surprise when you stumble upon free things to do there. The summer is the best time to take up on all the free offerings around the city, and LG News Intern Susmita Baral shares her finds on how to make the most of your time in the Big Apple! If you’re after something more than the typical tourist locations, then consider participating in the free yoga and tai chi classes in Bryant Park all summer long, dropping by at Etsy Labs (55 Washington St.) on a Monday night when you can participate in a free craft project from 4 p.m. to 8 p.m., or catch a HBO movie in Bryant Park (the lawn opens at 5 pm). 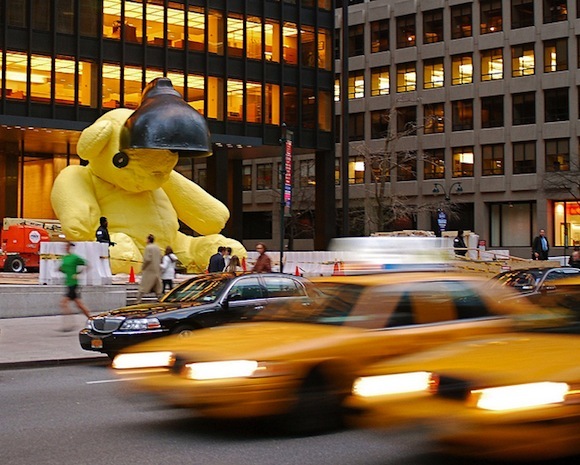 A 35,000 pound bronze sculpture of a massive yellow teddy bear slouching under a lamp, created by Swiss artist Urs Fischer, is on display outside of the Seagram building in New York City until September 30th. 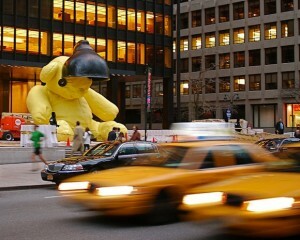 The sculpture, which is 23 feet tall, is expected to sell for $10 million when it is auctioned at Cristie’s. Only two other pieces of this sculpture exist, but both are privately owned and not available for public viewing. The Metropolitan Museum of Art is hosting the exhibit Alexander McQueen: Savage Beauty until September. The exhibition celebrates McQueen’s contribution to fashion featuring his postgraduate collections from 1992 until his final runway collection that took place after his untimely death. The exhibit features approximately a hundred ensembles and seventy accessories from the archives in London, some Givenchy pieces and items from private collections. Entrance to the exhibit is free with a ticket for the MET. Note: The exhibit is closed on Mondays. A 44-foot-high white statue of head is located in Madison Square Park until August 14. The statue, called “Echo,” was created by Spanish artist Jaume Plensa out of fiberglass resin and is modeled after the Greek myth of Echo. While you’re in the park, grab a bite to eat from Shake Shack (also located in the park) and enjoy your meal on one of the many benches or in the park. Insider tip: Beware of the squirrels and pigeons—they show no shame when it comes to food! 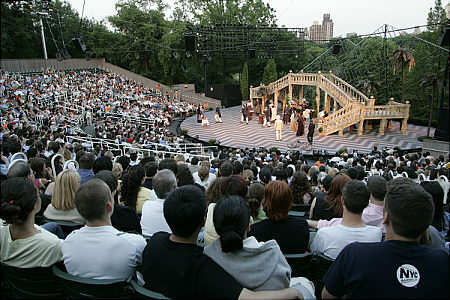 Watch a free performance of the Bard’s Measure for Measure and All’s Well That Ends Well in Central Park as part of the summer’s Shakespeare in the Park offerings. The theater hands out free tickets starting at 1 p.m.—only two tickets per person. Also in Central Park, starting July 11, will be the Metropolitan Opera’s Summer Recital series where rising opera stars like soprano Angela Meade, mezzo-soprano Jennifer Johnson Cano, and tenor Dimitri Pittas will perform. The Better than Jam Co-Op sets up shop in Governors Island home with 35 NYC vendors all selling handmade wares, like Groundsel’s recycled cotton messenger bags adorned with scenes of island history and architecture, fabric plush toys by Windows of Agate, and charming men’s and women’s hats by Rocks and Salt. Check out the calendar of events for Governors Island to coincide your trip with one of the many concerts, festivals and events the island hosts. Address: Nolan Park, Historic Home 6B. Fri 11am–4pm; Sat, Sun 11am–5pm; free. Through Sept 5. Note: A free ferry also runs from Brooklyn Bridge Park, Pier 6, on Saturdays, Sundays and holiday Mondays. And for a limited time only, the city offers a variety of events including the Lincoln Center Festival featuring ballet, music, dance and more from July 5 – August 14 (some events are free), the NYC River to River Festival featuring a variety of music performances, movies and readings from June 19 – July 16 (see website for details), or watch a series of David Michalek’s hyper slow motion Portraits in Dramatic Time from July 5 through July 31. These are all great suggestions, that is the great thing about NYC in the summer! But one thing to note: for those interested in the Shakespeare on the Park – they start handing out tix at 1pm but people line up as early as 6am so although fun and free it may not be worth wasting hours in line for! Absolutely..These are great suggestions for spending summer with family with great fun and enjoyment.I will sure visit these places. Thanks for the information.